RI0174D. 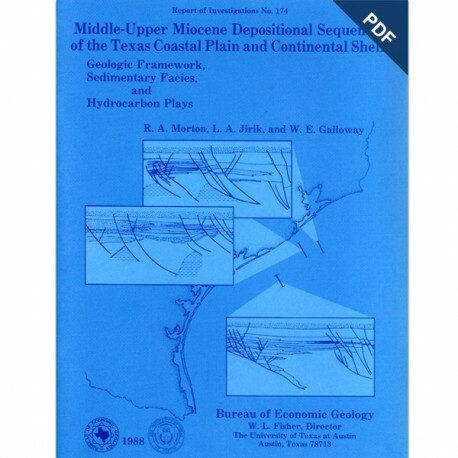 Middle-Upper Miocene Depositional Sequences of the Texas Coastal Plain and Continental Shelf: Geologic Framework, Sedimentary Facies, and Hydrocarbon Plays, by R.A. Morton, L.A. Jirik, and W.E. Galloway. 40 p., 24 figs., 2 tables, 1 appendix, 7 pls., 1988. doi.org/10.23867/RI0174D. Downloadable PDF. For book format: RI0174. RI0174D. Middle-Upper Miocene Depositional Sequences of the Texas Coastal Plain and Continental Shelf: Geologic Framework, Sedimentary Facies, and Hydrocarbon Plays, by R. A. Morton, L. A. Jirik, and W. E. Galloway, assisted by Nancy Banta, Emil Bramson, Richard Erdlac, and Denise Hanna. 40 p., 24 figs., 2 tables, 1 appendix, 7 pls., 1988. doi.org/10.23867/RI0174D. Downloadable PDF. To purchase this publication in book format, please order RI0174. Middle-upper Miocene depositional sequences of offshore Texas represent the last regionally significant influx of terrigenous elastic sediments into the western Gulf Coast Basin. Interpretations made on the basis of well logs and seismic lines indicate that sediments of this depositional episode constitute a major regressive wedge bounded above and below by the widespread Bigenerina A and Amphistegina B shales, respectively, and subdivided by the less extensive Textularia stapperi shale; landward equivalents are sandstones and mudstones of the Goliad Formation where it crops out along the Texas Coastal Plain. The episode began when the South Brazos delta system prograded across the foundered early Miocene continental platform and extended the shelf margin basinward. This delta system was fed by the Eagle Lake mixed-load fluvial system, which supplied large volumes of sand and mud to the narrow continental shelf, where deltaic deposits were redistributed by waves and longshore currents. 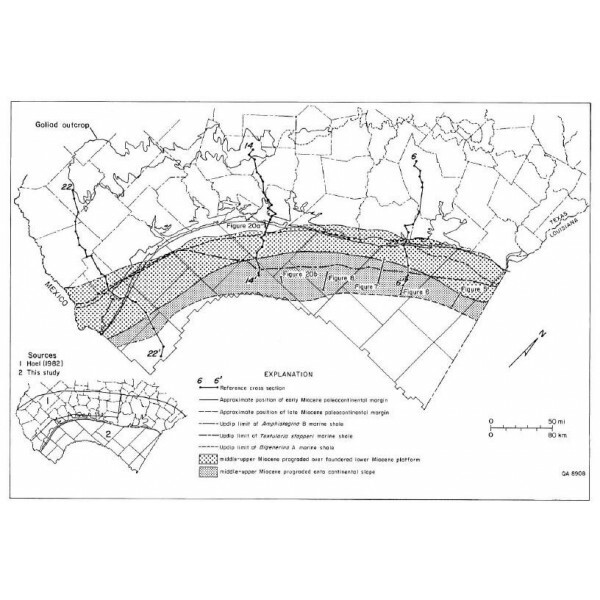 Most of the sand was either stored in the delta and the contiguous slope system or transported northeastward to the adjacent interdeltaic Galveston strandplain system, which was also supplied locally by bed-load streams of the Tomball fluvial system. Some of the sand, however, was transported as a sand plume to the southwest (downdrift), where it accumulated on a sediment-starved stable shelf. After the brief Textularia stapperi transgression, a small wave-dominated delta occupied the Rio Grande Embayment, where the South Padre shelf system had formerly aggraded. The other coastal plain and shore-zone systems continued to aggrade and then entered a retrogradational phase that culminated in the Bigenerina A marine transgression. During this terminal phase of the episode, a broad barrier-island and lagoon complex formed between the South Brazos and South Padre delta systems. Sandstone reservoirs of the middle-upper Miocene depositional complex have produced nearly 500 million boe from fields composing nine hydrocarbon plays. About half of the recoverable reserves, which are mostly gas, are associated with two shelf-margin plays located along the faulted delta front and the adjacent strandplain. These primary plays offer the greatest potential for new field discoveries and significant reserve additions. A prolific play of secondary importance accounts for nearly all of the oil produced from middle-upper Miocene reservoirs. It coincides with the supermature salt-dome province of the Houston Embayment, where secondary migration is responsible for hydrocarbon accumulation in middle-upper Miocene sediments. Exploration potential in the remaining plays generally is limited by small fields, thin reservoirs, and the predominance of gas. Morton, R. A., Jirik, L. A., and Galloway, W. E., 1988, Middle-Upper Miocene Depositional Sequences of the Texas Coastal Plain and Continental Shelf: Geologic Framework, Sedimentary Facies, and Hydrocarbon Plays: The University of Texas at Austin, Bureau of Economic Geology, Report of Investigations No. 174, 40 p.